This article is about the TBS talk show. For Conan O'Brien's former talk shows, see Late Night with Conan O'Brien and The Tonight Show with Conan O'Brien. Conan is a late-night talk show airing each Monday through Thursday at 11:00 p.m. eastern time on TBS in the United States. The show premiered on November 8, 2010, and is hosted by writer, comedian and performer Conan O'Brien, accompanied by his long-time "sidekick" Andy Richter. Describing itself as a traditional late-night talk show, Conan draws its comedy from recent news stories, political figures and prominent celebrities, as well as aspects of the show itself. For eight years, Conan aired as an hour-long show akin to O'Brien's previous NBC late-night shows. The show was reformatted to a half-hour length starting January 22, 2019. On May 17, 2017, TBS renewed the series to 2022. Guests come from a wide range of cultural sources, and include actors, musicians, authors, athletes and political figures. The original hour-long show opened with Richter proclaiming "Coming to you from Warner Bros. Studios in Burbank, it's Conan! ", and introducing O'Brien, The Basic Cable Band, as well as the episode's guests. For the first several seasons, each episode had a title, which Richter would announce at the end of the opening sequence. The titles were in the style of old fashioned murder-mystery radio shows, television sitcoms, or other assorted jokes. The episode titles were dropped in early 2014. The original title sequence was designed by Rob Ashe, Dan Dome and Eric McGilloway. There were several different variations of the opening credits, with the final product being inspired by graphic designer Saul Bass. The opening design process was described by Ashe as utilizing "organic-looking textures made of construction paper, soak them in soda, and light them in Photoshop." O'Brien opens each episode with a monologue drawing from current news stories and issues. The monologue is sometimes accompanied by clips and brief comedy skits, in addition to occasional interactions between O'Brien and Richter, and the audience. One or more comedy bits followed the monologue. Following the monologue, some comedy bits (such as those based on video clips) were presented from the monologue stage. Following the first commercial break, additional comedy sketches were typically introduced presented from the desk area. Some sketches were original and appeared only once. Occasionally an additional sketch would air between the first and second guest. In May 2018, O'Brien and TBS announced the show would be reformatted into a 30-minute show, with a looser structure starting 2019. In January 2019, O'Brien gave a more detailed description of the new format of his show. It would not feature a band or a desk area, and for the first time as host of a talk show O'Brien would not be wearing a suit. He commented, "I really don’t miss the desk. It started to feel like I’m doing someone’s taxes." The last hour-long regular episode aired on October 4, 2018. The new reformatted version premiered on Tuesday January 22, 2019 on TBS. O'Brien's first guest for the new-look show was Tom Hanks. October 31–November 3, 2011: taped at the Beacon Theatre in New York City. Guests included Jimmy Fallon, Hugh Jackman, Matthew Broderick and Louis C.K..
June 11–14, 2012: taped at the Chicago Theatre in Chicago, Illinois as part of the TBS Just for Laughs Festival. Guests included Jack McBrayer, Andy Samberg, Johnny Galecki and Adam Sandler. April 1–4, 2013: taped at The Tabernacle in Atlanta, Georgia to coincide with the NCAA Final Four being held a few blocks away at the Georgia Dome. Guests included Seth Rogen, Paul Rudd, Steven Yeun and Charles Barkley. March 31–April 3, 2014: taped at the Majestic Theatre in Dallas, Texas to coincide with the NCAA Final Four. Guests included Dirk Nowitzki, Adam Sandler, Seth Rogen, Simon Helberg and Charles Barkley. July 8–11, 2015: taped at the Spreckels Theatre in San Diego, California to coincide with Comic-Con. Guests include Elijah Wood, Jennifer Lawrence, Josh Hutcherson, and Peter Capaldi. July 20–24, 2016: returned to the Spreckels Theatre in San Diego to coincide with Comic-Con. Guests include The cast of Arrowverse shows, Will Arnett, and the cast of Game of Thrones. October 31–November 3, 2016: taped at the Apollo Theater in Harlem. July 19–23, 2017: had live shows from the Spreckels Theatre in San Diego to coincide with Comic-Con for the third year in a row. Guests were the casts of Bright, Supernatural, Kingsman: The Golden Circle, The Lego Ninjago Movie, and Game of Thrones. November 6–9, 2017: taped at the Apollo Theater in Harlem. July 18–22, 2018: had live shows from the Spreckels Theatre in San Diego to coincide with Comic-Con for the fourth year in a row. Guests were the casts of Breaking Bad, The Predator, Glass, and Aquaman. O'Brien filmed several specials abroad. These episodes did not follow the traditional format and were not filmed before an audience. Instead, they involve O'Brien being followed by a camera crew as he focused more on the normal life of the locals and visiting cultural locations, all while improvising to provide comedy. March 4, 2015: Conan in Cuba, taped in Havana. With relations between the United States and Cuba improving, O'Brien and a film crew went to Havana for four days around the weekend of February 14–15 to tape segments for an episode. This is not a regular live-to-tape show featuring celebrity guests, with Conan focusing on normal life for citizens of the country by visiting a cigar factory and learning the rumba while improvising his own material. The episode marks the first time an American late-night talk show has filmed in Cuba since Jack Paar interviewed Fidel Castro on The Tonight Show in 1959. November 17, 2015: Conan in Armenia: The episode centered around taking his long-time assistant Sona Movsesian back to her homeland of Armenia to connect with her heritage. January 25, 2016: Conan in Qatar: Conan travelled to the Al Udeid Air Base in Qatar with First Lady Michelle Obama. The episode's alternative title was Mission Conan. April 9, 2016: Conan Does Korea: Conan traveled to South Korea along with Steven Yeun, the visit also included a trip to the Korean DMZ, technically resulting in an additional trip by crossing the border into North Korea. December 7, 2016: Conan in Berlin: Conan traveled to Berlin, Germany along with Flula Borg. March 1, 2017: Conan Without Borders: Made in Mexico: Visit was made in response to actions and effort made by President Donald Trump to build a wall across the southern border. Guests included Diego Luna and Vicente Fox, and stand-up performance from Sofia Niño De Rivera. January 27, 2018: Conan Without Borders: Haiti: Conan visited the island nation in response to President Donald Trump's alleged description of the country and parts of Africa as "shitholes". April 11, 2018: Conan In Italy: Conan and producer Jordan Schlansky visit Italy, with Conan hoping to expose Schlansky as a fraud. November 28, 2018: Conan In Japan: After finding out that the Japanese town of Hokuei, Tottori is also well known as “Conan-Town” (named for the popular anime/manga character Detective Conan), Conan makes a visit to the country. Following the 2010 Tonight Show conflict, O'Brien announced on the first day of The Legally Prohibited from Being Funny on Television Tour that he had signed a deal with cable network TBS to host a talk show on their late-night lineup, beginning in November 2010. Before the deal was announced, O'Brien initially had reservations about the move, as it would place comedian George Lopez's show, Lopez Tonight, one hour later to midnight, effectively doing to Lopez what NBC had wanted to do with O'Brien. However, Lopez reportedly called O'Brien and expressed his excitement about the move. Lopez went on to state, "I can't think of anything better than doing my show with Conan as my lead-in [...] It's the beginning of a new era in late-night comedy." Lopez Tonight would be cancelled less than nine months later. In an official press release by Turner Broadcasting, it stated that O'Brien had only begun negotiations a week prior to the official announcement of the show. Steve Koonin, President of Turner Entertainment Networks, went on to comment of the announcement, "Conan has been the comedic voice for a generation. TBS already has a huge audience of young comedy lovers, and Conan's show will give these fans even more reasons to watch our network." In his own statement about the deal, O'Brien stated, "In three months I've gone from network television to Twitter to performing live in theaters, and now I'm headed to basic cable. My plan is working perfectly." O'Brien's production company, Conaco, reportedly owns all rights to the show. In addition to the announcement of the television series, TBS also announced a one-hour TBS Special, featuring several writers for Conan, as well as comedian Reggie Watts, who participated in O'Brien's Legally Prohibited from Being Funny on Television Tour. The show was broadcast on June 27, 2010, leading up to the beginning of Conan in early-November. Additionally, in preparation for the show, a 24-hour "Live-Coco Cam" was set up on October 20, 2010, and featured various characters and staff members of Conan, including Richie Rosenberg, otherwise known as "LaBamba," as well as a short online broadcast from O'Brien's office entitled "Show Zero" on November 1, 2010. The show featured O'Brien as host, and was accompanied by Andy Richter, as well as Jerry Vivino, a member of the Basic Cable Band. The broadcast hosted several guests, including actor Jim Parsons and indie rock band Steel Train, and lasted a total of four minutes, and 51 seconds. Weeks before the premiere, an orange Conan blimp was introduced to further promote the show. Designed by Blue Sky, an Atlanta firm, the dirigible provided aerial footage for 2010 Major League Baseball postseason games airing on TBS. It has since been incorporated into sketches on Conan, including a running gag where the blimp would follow actor Gary Busey around southern California, much to his chagrin. The first episode of Conan, entitled "Baa Baa Blackmail", premiered on Monday, November 8, 2010 at 11 p.m. EST on TBS. The episode's first guest was Arlene Wagner, the curator of Leavenworth, Washington's Nutcracker Museum. Wagner's position as Conan's debut guest was chosen by fans through a "rigged" poll at Conan O'Brien's official website, TeamCoco.com. The poll also consisted of Pope Benedict XVI, Russian Prime Minister Vladimir Putin, performers Justin Bieber and Lady Gaga, and actor Jack Nicholson, among others. Wagner's brief appearance was followed by actor and comedian Seth Rogen and actress Lea Michele, along with musical guest Jack White, who performed "Twenty Flight Rock", along with O'Brien himself. Actor Jon Hamm, appearing as his character Don Draper from the AMC series Mad Men, and talk show host Larry King, of CNN's Larry King Live, made cameo appearances in the show's cold open, with actor and comedian Ricky Gervais sending Conan a pre-taped message expressing his well wishes on the new series, then going on to express condolences for future job losses. Reviews of the premiere episode by television critics were positive, calling it "a looser, quirkier take on a late-night talk show, but still a late-night talk show." James Poniewozik of Time found the episode to be enjoyable, and compared it to O'Brien's tenure during Late Night. Itzkoff went on to state, "The message, overall [...] is that Conan the show is not so much about a reinvention of the talk show form as a restoration of Conan. He was doing something he wanted to do, a late-night talk show, and NBC made him stop doing it." He also praised the opening monologue, and Conan's performance with Jack White during the episode's conclusion. Frazier Moore of Associated Press went on to call the episode "a stylishly back-to-basics hour that radiated hard-won lessons from his brief stay hosting The Tonight Show," in addition to admiring O'Brien's "appealingly stoked yet comfortable" appearance on the show. Ken Tucker of Entertainment Weekly also appreciated the Masturbating Bear cameo, and went on to call the show "pleasant, if a bit underwhelming." Less positive assessments of the show included Tom Gliatto of People, who accused the show of being a "modest, lowkey and slightly awkward affair." In overnight Nielsen Ratings, the series premiere of Conan drew 4,100,000 viewers, leading all late-night talk shows, more than tripling the audience of its direct competition, The Daily Show and The Colbert Report on Comedy Central. In the 18–49 demographic, Conan drew a 2.5 rating and 3,285,000 viewers. It was also watched by 2,451,000 adults in the 18-34 demographic. Ratings throughout the rest of the week fell, and ended with over 2.02 million viewers on Thursday, November 11, 2010. The fourth episode still led every talk show in the 18–34 and 18–49 demographics, however, delivering 980,000 adults and 1,361,000 adults respectively. The median viewer age for the first week of shows was projected to be at 32, significantly younger than that of The Tonight Show and CBS's Late Show . The show also premiered in Canada, on The Comedy Network at midnight, drawing 171,000 viewers, and the repeat broadcast at 1 AM on CTV drew 302,000 viewers. During O'Brien's second week, ratings remained somewhat consistent, and peaked on November 16, 2010, with 1.84 million viewers, according to Nielsen ratings. The week would go on to average 1.7 million viewers, and earn an average rating of 1.0 in the 18–49 demographic. During the week of December 13–17, 2010, Conan has fallen behind in the weekly overnight Nielsen Ratings, averaging only 1.3 million viewers, compared to NBC's The Tonight Show (4.2 million), CBS's Late Show (3.6 million), ABC's Jimmy Kimmel Live! (1.6 million), and Comedy Central's The Daily Show with Jon Stewart (1.6 million). In January 2011, Michael Wright, head of programming of TBS, said the show was "landing right about where we expected it to. At this number, Conan will run as long as he wants it to." For the month of June 2011, Conan fell for the first time to fourth among U.S. late-night cable talk shows, behind The Daily Show, The Colbert Report, and Chelsea Handler's Chelsea Lately; Conan attracted an average of 743,000 total viewers, compared with 808,000 viewers for Chelsea Lately. Among viewers 18-to-49, O'Brien averaged 503,000 viewers vs. Handler's 559,000. Following the cancellation of Lopez Tonight, Steve Koonin of Turner Entertainment stated he "could not be happier with Conan as a show or Conan O'Brien and Team Coco as people and an organization," going on to say that "what Conan has already won is the absolute [embrace] of young people." In August 2011, TBS secured the cable syndication rights to The Big Bang Theory at a reported $4 million per episode to serve as a lead-in to Conan three nights a week. "[O'Brien's] program is the signature show of our line-up and the centerpiece of our network," Koonin said in an interview with The Wall Street Journal. In March 2012, it was revealed that Conan draws more Hispanic viewers than any other late night program. On May 14, 2014, TBS renewed the show through 2018. For January–October 2013, Conan attracted $67.4 million in advertising for an audience that is the youngest compared with seven late-night shows on CBS, NBC, ABC, Comedy Central, and E!. Viewership in 2013 was 808,000, down from 914,000 in 2012. Conan does well in ratings among low income inner city viewers. As a result, many of the show's advertisers often use Conan as a bridge to reach them. By fall 2015, in the face of new competition from The Late Show with Stephen Colbert and The Tonight Show Starring Jimmy Fallon, Conan's live audience had fallen to 299,000 viewers in the demographic of persons 18 to 49, the lowest of all of the major national late-night talk shows. In contrast to its live audience, Conan boasts strong online revenues with a particularly young viewership that TBS has leveraged into lucrative advertiser relationships targeting digital and social media. TBS has also cited O'Brien's role as executive producer on shows such as People of Earth, Final Space and a Clueless Gamer spin-off series as evidence of the host's value to the network as a brand and partner beyond the talk show, further stating, "We're going to be in business with him for a long time." On May 17, 2017, TBS renewed the show through 2022. Conan tapes at Stage 15 on the Warner Bros. lot in Burbank, California. On May 16, 2010, it was announced that O'Brien would launch his new show at Stage 15 on the Warner Bros. lot in Burbank, California, the soundstage where films such as Calamity Jane, The Music Man, Blazing Saddles, Ghostbusters and the Ocean's Trilogy were shot. Taping of each episode begins at 4:30 p.m. PST, which usually follows a rehearsal, lasting from 1 p.m. until 3 p.m.
O'Brien has made explicit that the staff has made an effort thus far to not to reuse any of the previous Late Night or Tonight Show sketches although noted this was sometimes difficult and they were unsure if some sketches were going to work. However he stated in the past, such as in an interview with Larry King during his last week on CNN, that he possibly would bring back certain bits in time. Indeed, O'Brien has brought back several skits and characters he and his writers created on NBC, even if used less frequently than in the past. These characters and bits include The Masturbating Bear, Triumph, the Insult Comic Dog, Celebrity Survey, The Audiency Awards, Clutch Cargo interviews, and an update on the "Late Night" sketch If They Mated called If They Melded. The final day of longtime writer/performer Brian Stack also saw the one-time return of one of his characters, The Interrupter. Prior to the show's airing, interviews with O'Brien and Richter indicated that the show would more closely represent Late Night than Tonight in regard to content and material, meaning that edgier or questionable content excised as a result of the move to the earlier time slot will no longer be an issue at TBS. On the July 12, 2010 episode of Marc Maron's WTF podcast, Andy Richter said that they no longer have to "worry about living up to a respected franchise", and that on The Tonight Show certain sketches "that just felt too 12:30" would be cut and how "it'll be nice to not have to worry about that anymore". During an appearance at the 2010 San Francisco Sketch Comedy Festival, O'Brien told the audience he was "no longer interested in 'broadening' the audience or trying to reach everybody of all ages," further implying the content will not be toned-down. As the show is on cable, fewer restrictions will apply to the show in regards to explicit content, such as swearing and racier material. On September 1, 2010, O'Brien officially announced via a YouTube video that the new show's title was simply Conan. Conan as the title could run into a consent issue with Conan Properties International, the owners of the Conan the Barbarian franchise, including a "Conan" trademark covering certain types of TV series. Prior to the show's broadcast, it was stated that the set for the show, designed by the same designers of Conan's previous sets, John Shaffner and Joe Stewart, would be inspired by The Legally Prohibited Tour, adopting more of a "theatre" appearance than the previous shows. Shaffner commented on the choice of the show's chair, stating, "You find one that you like and then you build it yourself to make it a little shallower and a little more upright and the cushion a little firmer [...] But not too firm or every time the guest sits down they’ll say, 'Oooh this is a hard chair.'" The rest of the set has been described as being "filled with warm wood tones and electric blue screens," and has been compared to the set of his most recent stint on The Tonight Show. The new set features several differences, however, including a remote-controlled moon, and the backdrop being transformed into a giant blue ocean. In keeping with a change made during The Tonight Show, Andy Richter joins O'Brien during celebrity interviews on the main set rather than remaining behind a lectern after the monologue. The first show of 2018 saw the debut of a new set design by production designer Christopher Goumas, which replaced the ocean backdrop with one depicting a studio backlot highly reminiscent of the Warner Bros. lot where the program shoots. O'Brien now enters through a doorway on the left of the stage rather than a curtain on the right. The host explained that the space is also deliberately tighter to promote a more "intimate" atmosphere, and humorously demonstrated the ability for the set to be moved even closer to the audience on demand. In May 2018, it was announced by TBS and O'Brien that the show will switch to a half-hour format in 2019. Conan O'Brien's longtime band, originally known as The Max Weinberg 7, then The Tonight Show Band, and later as the Legally Prohibited Band, serve as the Conan house band, and are fronted by longtime guitarist Jimmy Vivino. The band also consists of Richie "LaBamba" Rosenberg on trombone, Scott Healy on keyboard, Mike Merritt on bass guitar, Mark Pender on trumpet and Jerry Vivino on woodwinds. When the group moved to Los Angeles to play for The Tonight Show, they added an eighth member, James Wormworth, on percussion. Max Weinberg, who had served as O'Brien's bandleader and drummer since 1993, does not appear on the new program. Weinberg was not a part of the Legally Prohibited Tour, and remained vague throughout most of 2010 about the possibility of his participation in the new TBS show. Weinberg's decision was influenced by a combination of a major heart surgery he had in February 2010, and the fact that his family never left their native New Jersey, even during the Tonight Show period, both issues that he kept private until an October 2010 interview. Percussionist James Wormworth, who often acted as Weinberg's on-air substitute, serves as the band's permanent drummer. Following Weinberg's exit, O'Brien sought to revamp the show's title theme song. In an interview with New York Magazine, O'Brien expressed his desire to create a new introduction from the previous Late Night and Tonight compositions, which were used for O'Brien's entire 17-year relationship with NBC, and ultimately unveil a new signature sound for the show. The new theme song was co-written by bandleader Jimmy Vivino, and O'Brien himself. Despite no obvious copyright issues to continue using the previous theme, which was written by Howard Shore and John Lurie, O'Brien stated of the transition to a new composition, "it just felt like the right thing to do [...] There's this feeling of, 'Let's try and build something new.' I came out to that theme for seventeen years and it does feel like, you know what? Let's try some new stuff. Let's try and change it up." However, the closing theme from his previous NBC shows was retained in a slightly altered form. On October 4, 2018, it was announced that with the format change, Jimmy Vivino and the Basic Cable Band would not be returning in 2019. 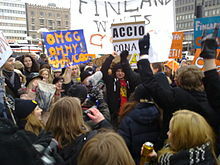 "Finland Wants Conan" demonstrative gathering in Helsinki, Finland. Finnish fans wanted to see Conan's new show air in Finland. In Australia, the program was aired on GO!, a multichannel of the Nine Network from August 2012 following the 2012 Olympic Games but eventually dropped by GO! mid-2014.Originally it was intended to screen within 12 hours after its original U.S. broadcast at 11:30pm weeknights,. The Comedy Channel which aired the previous versions of Conan's shows announced it would not air the program as the Nine Network had exclusive rights to Time Warner programs. Between November 2010 to July 2012, Conan was aired on GEM. In Israel, the program began airing in early 2011 on the newly launched Comedy Central Israel channel. episodes were aired 4–5 days after their original TBS broadcasts. However, the channel has discontinued airing Conan in October 2011. From November 8, 2010 to August 30, 2013, the program aired in Canada on cable channel The Comedy Network on Monday to Thursday nights (Tuesday to Friday mornings) at midnight ET/PT, with a repeat on broadcast network CTV at 1:07 a.m. local time. The program was only initially announced for CTV, leading to some concern about the unusually late time slot, two hours after its airing in the United States for viewers in the Eastern Time Zone (the program airs on CTV Atlantic at 1:05 a.m. AT / 12:05 a.m. ET). This is due to local and national newscasts in the 11:00 p.m. hour, and CTV's commitments to The Daily Show with Jon Stewart at 12:05 a.m. and The Colbert Report at 12:35 a.m.[needs update] CTV executives later said the program would likely air earlier on The Comedy Network, which is owned by CTV. However, that channel also had a conflict, since it has long aired both Daily and Colbert during the 11:00 p.m. ET hour, simulcasting the Comedy Central feed. The Comedy Network then attempted to move up both programs to 10:00 p.m. ET beginning in September 2010, presumably to make room for Conan at 11:00; however, there were intermittent "technical difficulties" with getting the shows in time for the earlier airing, particularly for a series of special live Daily episodes in late October, which meant re-runs were aired in their place. After viewer complaints about the missed episodes, Comedy elected to move both shows back to their previous timeslots, meaning that Conan was rescheduled on that channel to midnight, on a one-hour delay from TBS. On September 3, 2013, Much Music began broadcasting the program every Monday to Thursday at 11 p.m. ET (8 p.m. Pacific), though it was moved back to its time-delayed midnight airing the following month. The repeat on CTV was moved to 1:37 a.m. On September 3, 2014, the program began airing on Much at 12:30 a.m. after @midnight. On January 9, 2017, Conan began airing at 11 p.m. ET again, only to again be moved back an hour to midnight in April of that same year. Conan aired on Much until September 1, 2017 and now solely airs on CTV. Selling rights to a Canadian channel was necessary, since TBS ceased being available in Canada in October 2007. The local Atlanta station through which Canadian cable subscribers had previously received TBS programming then adopted a distinct schedule as WPCH-TV. Some speculated that WPCH might pick up the program anyway, since the revamped station continues to air some of the same syndicated series as TBS, but WPCH later indicated explicitly that it had no plans to broadcast the new O'Brien program. In the UK and Ireland the show aired on the channel truTV since its launch in August 2014, though it has been absent from the schedules as of August 2017. In Portugal, Conan is retitled Conan O'Brien. The show is aired on SIC Radical, in the same timeslot as his previous NBC shows, with daily broadcasts beginning in October 5, 2009. The show airs Monday to Friday beginning around 20h45 to 21h30, following The Daily Show, with occasional reruns interspersed among new shows. New episodes air about two weeks after US broadcast.Although since January 2016 SIC Radical stopped airing the show because of the show's international distributor has ceased shipping the show outside USA (answer from the Distributor Sic Radical). The show is aired in Southeast Asia and Hong Kong on FX. It has aired in India, Sri Lanka, Nepal and Bhutan on WB Channel. It has aired in Pakistan, Bangladesh, Afghanistan, Iran and Tajikistan on WB Channel. ^ a b "First Week of Conan Attracts Large Audience of Young Viewers". Turner Newsroom. November 12, 2010. Retrieved November 13, 2010. ^ a b c de Moraes, Lisa (May 17, 2017). "Conan O'Brien Signs 4-Year TBS Deal; Says Show Will Become Leaner, More Agile, Less Predictable". Deadline Hollywood. Retrieved May 17, 2017. ^ Collins, Scott (November 9, 2010). "Conan O'Brien grabs 4.2 million viewers in TBS premiere". Los Angeles Times. Retrieved November 20, 2010. ^ a b Ashe, Rob. "Designing Conan". Creative Cow. p. 1. Retrieved June 11, 2011. ^ a b de Moraes, Lisa (May 3, 2018). "‘Conan’s New Half-Hour Format Means Fewer Celebrity Interviews, More Comedy". Deadline Hollywood. Retrieved January 23, 2019. ^ Chow, Andrew R. (May 3, 2018). "Conan O'Brien's Talk Show Will Shrink to a Half-Hour". The New York Times. Retrieved October 5, 2018. ^ Wright, Megh (January 14, 2019). "Conan Returns Next Week With Tom Hanks and the Cast of The Good Place". Vulture. Retrieved January 23, 2019. ^ Itzkoff, Dave (January 14, 2019). "Conan O'Brien Wants to Scare Himself With the New, Shorter 'Conan'". The New York Times. Retrieved January 23, 2019. ^ Martin, Montana (January 14, 2019). "Conan to Return to TBS Next Week with Revamped Format, First Guest Star Tom Hanks". Paste. Retrieved January 23, 2019. ^ "Conan NYC @". Teamcoco.com. November 3, 2011. Retrieved February 10, 2014. ^ "CONAN Chicago @". Teamcoco.com. Retrieved February 10, 2014. ^ "CONAN Live From Atlanta @". Teamcoco.com. Retrieved February 10, 2014. ^ "CONAN in Dallas Texas @". Teamcoco.com. Retrieved February 14, 2014. ^ a b "CONAN at Comic-Con®". Teamcoco.com. Retrieved June 24, 2015. ^ "Conan in Cuba". Teamcoco.com. Retrieved March 16, 2015. ^ Conan O'Brien [@ConanOBrien] (17 February 2015). "1/2: I just spent the last four days shooting my show all around the city of Havana. I made countless friends and had one of the best" (Tweet) – via Twitter. ^ "Watch Conan O'Brien Improve Diplomatic Relations With Cuba". Time. Retrieved March 5, 2015. ^ "Conan O'Brien Just Filmed an Episode in Cuba". Variety. February 15, 2015. Retrieved February 15, 2015. ^ "Conan Armenia". Teamcoco.com. Retrieved November 29, 2015. ^ "Mission Conan". Teamcoco.com. Retrieved January 22, 2016. ^ "Conan Announces "Conan Without Borders: Made In Mexico"". TeamCoco. ^ Team Coco (16 August 2017). "Conan Announces "Conan Without Borders: Israel" - CONAN on TBS" – via YouTube. ^ Samuels, Brett (January 16, 2018). "Conan to film show in Haiti in response to Trump's 's---hole' comments". The Hill. Retrieved January 16, 2018. ^ "Conan O'Brien Is in Italy Filming His Next 'Conan Without Borders' Special". 12 February 2018. ^ "Conan O'Brien announces trip to Japan in negotiation over rural Tottori Prefecture's Conan Town". SoraNews24. 2018-08-29. Retrieved 2018-11-30. ^ Carter, Bill (April 12, 2010). "How the Conan O'Brien-TBS Deal Happened". The New York Times. Retrieved April 12, 2010. ^ a b c d "Conan Picks a Home – And It's TBS". Turner Newsroom. April 12, 2010. Retrieved November 8, 2010. ^ Carter, Bill (April 12, 2010). "Conan O'Brien Will Do a Late-Night Show on TBS". The New York Times. Retrieved July 12, 2010. ^ Finke, Nikki (April 12, 2010). "Conan O'Brien makes TBS deal! How it all went down, and how Team Conan thought out of the network box all along". Deadline Hollywood. Retrieved April 12, 2010. ^ a b "Andy Richter and Conan O'Brien Writers Team Up for One-Hour TBS Special". Turner Newsroom. May 26, 2010. Retrieved November 11, 2010. ^ ""Live Coco Cam" Gives Conan O'Brien Fans Live 24-Hour Peephole into Team Coco Offices on Wednesday, Oct. 20 at 10 a.m. PT / 1 p.m. ET". Turner Newsroom. October 18, 2010. Retrieved November 14, 2010. ^ Macht, Dan (October 21, 2010). "Conan Launches 24-Hour Live "Coco Cam"". nbclosangeles.com. NBC News. Retrieved November 14, 2010. ^ Tucker, Ken (November 1, 2010). "Conan O'Brien online 'Show Zero' review: Gee, that was fast..." Entertainment Weekly. Retrieved November 14, 2010. ^ Barol, Bill (October 12, 2010). "The Birth of the Conan Blimp". Boing Boing. Retrieved November 24, 2010. ^ "Conan Blimp Stalks Gary Busey". The Daily Beast. November 23, 2010. Retrieved November 24, 2010. ^ a b c d e Poniewozik, James (November 9, 2010). "Conan Returns: Stop Me If You've Heard This One Before". Time. Retrieved November 9, 2010. ^ "Conan Drives Explosives-Filled Car Off Cliff In Amazing New TBS Promo". Huffington Post. October 15, 2010. Retrieved October 22, 2010. ^ "Conan's New Show Debuts Tonight With Woman From Leavenworth As His First Guest". khq.com. KHQ News. Retrieved November 9, 2010. ^ a b Corsiglia, Gina (November 8, 2010). "Cracking Nuts: Washington's Arlene Wagner To Be Conan's First Guest". Seattlest. Retrieved November 9, 2010. ^ "Conan O'Brien Announces First Week of Guests for Conan". Turner Newsroom. October 21, 2010. Retrieved October 21, 2010. ^ Moore, Frazier (November 9, 2010). "Conan O'Brien returns to late-night TV with ease". The Washington Post. Associated Press. Retrieved November 9, 2010. ^ Tucker, Ken (November 9, 2010). "'Conan' first-night review: Coco's so-so show". Entertainment Weekly. Retrieved November 9, 2010. ^ Gliatto, Tom (November 9, 2010). "People's TV Critic Picks Conan's Top 3 Moments". People Magazine. Retrieved November 9, 2010. ^ "The TV Ratings Guide: Before Late Night Became A Toilet of Trumpster Fire Jokes -- The 1991-2015 Late Night Talk Show Ratings". Archived from the original on 2018-04-13. Retrieved 2018-04-12. ^ Gorman, Bill (November 9, 2010). "'Conan' Premiere Averages 4.2 Million Viewers, 2.5 Adults 18–49 Rating". TV by the Numbers. Retrieved November 14, 2010. ^ a b Gorman, Bill (November 12, 2010). "'Conan' First Week Averages 2.9 Million Viewers, 1.6 Adults 18–49 Rating". TV by the Numbers. Retrieved November 12, 2010. ^ Andreeva, Nellie (November 12, 2010). "Conan Slides Again on Thursday; His First Week Tally Still Solid". Deadline Hollywood. Retrieved November 14, 2010. ^ Furdyk, Brent. "Conan Is The New King Of Latenight". TV Week. Archived from the original on November 13, 2010. Retrieved November 26, 2010. ^ a b Gorman, Bill (November 19, 2010). "'Conan's' Second Week Still Strong; Averages 1.0 Adults 18–49 Rating, 1.7 Million Viewers". TV by the Numbers. Retrieved November 19, 2010. ^ "Jay Leno and Jimmy Fallon Deliver Season Highs in Total Viewers to Rule the Late-Night Ratings Week of Dec. 13-17". Retrieved January 17, 2011. ^ Hibberb, James (January 11, 2011). "TBS: We'll air 'Conan' forever at these ratings (but O'Brien says he has other plans)". Inside TV at EW.com. Retrieved February 1, 2011. ^ a b Bazilian, Emma (July 1, 2011). "Team Coco Losing Out to Chelsea Lately". Adweek. Retrieved July 13, 2011. ^ Adalian, Josef (August 10, 2011). "Turner Exec on Conan Ratings: 'We Couldn't Be Happier'". nymag.com. Retrieved August 16, 2011. ^ Szalai, Georg (August 18, 2011). "TBS' Multi-Million Dollar Plan to Prop Up Conan O'Brien's Ratings". The Hollywood Reporter. Retrieved December 24, 2011. ^ "Conan O'Brien Says More Latinos Watch His Show Than Any Other Late Night Program". Huffingtonpost.com. Retrieved February 10, 2014. ^ a b c d Poggi, Jeanine (February 13, 2014). "Why Jimmy Fallon's 'Tonight Show' Can Thrive With Fewer Viewers When Conan's Couldn't". Advertising Age. Retrieved February 14, 2014. ^ O'Connell, Michael (November 11, 2015). Late Night's New Pecking Order: Colbert Holds His Own, Comedy Central Takes a Hit. The Hollywood Reporter. Retrieved November 22, 2015. ^ Steinberg, Brian (November 22, 2015). . Variety. Retrieved November 22, 2015. ^ Goldberg, Leslie (January 5, 2017). "Conan O'Brien To Remain Nightly". The Hollywood Reporter. Retrieved January 5, 2017. ^ Rice, Lynette (May 16, 2010). "Conan O'Brien to shoot TBS talk show on Warner Bros. TV lot". Entertainment Weekly. Retrieved February 12, 2011. ^ "Unofficial Warner Bros. Studios fansite - Soundstages". the studiotour.com. Retrieved December 19, 2011. ^ Ashe, Rob. "Designing Conan". Creative Cow. p. 2. Retrieved June 11, 2011. ^ Belloni, Michael (August 24, 2010). "Why doesn't Conan's TBS show have a name yet?". Reuters. Retrieved February 12, 2011. ^ "A chair for 'Conan'". CNN. September 2, 2010. Retrieved September 2, 2010. ^ a b c Ditzian, Eric (November 9, 2010). "Conan O'Brien Zings NBC, Brings Laughs During TBS Debut". MTV News. Retrieved November 20, 2010. ^ Hill, Michael (January 16, 2018). "Full moon sets on 'Conan' as show switches to new set". NewscastStudio. ^ "Conan's New Desk Is Much Closer To The Studio Audience". Youtube. January 17, 2018. ^ a b c Greene, Andy (September 24, 2010). "Max Weinberg Officially Splits With Conan O'Brien". Rolling Stone. Retrieved February 12, 2011. ^ a b c Schaeffer, Christian (September 22, 2010). "Jimmy Vivino Talks Johnnie Johnson, Conan O'Brien, and St. Louis' Role as a Rock & Roll Breeding Ground". Riverfront Times. Archived from the original on September 26, 2010. Retrieved November 14, 2010. ^ Bream, Jon (July 10, 2010). "Max Weinberg: From Conan to the Dakota". Star Tribune. Archived from the original on October 12, 2012. Retrieved July 11, 2010. ^ Buckman, Aaron (October 7, 2010). "Max Weinberg: Open Heart Surgery Influenced My Decision To Leave Conan". Fancast. Archived from the original on October 10, 2010. Retrieved November 14, 2010. ^ Adalian, Josef (October 29, 2010). "Conan Will Have a New Theme ... Co-Written by Conan". New York. Retrieved November 14, 2010. ^ "Conan is a cable guy now, but Emmy still likes him while neglecting Jay". Washington Post. Associated Press. July 14, 2011. Retrieved July 14, 2011. ^ "Press Release Nominations 2011 Emmys" (PDF). emmys.com. Academy of Television Arts & Sciences. July 14, 2011. Retrieved July 15, 2011. ^ "HBO Leads With 17 Creative Arts Emmys, CBS 13, PBS 11; 'Undercover Boss' Wins Reality Emmy; 'Daily Show' Writers, Jimmy Fallon, Kathy Bates, Jeremy Davies, Martha Plimpton Win Emmys; 'Wizards Of Waverly Place' & 'The Penguins Of Madagascar'". Deadline Hollywood. September 15, 2012. Retrieved September 16, 2012. ^ "65th Primetime Emmys Nominees and Winners". Emmys.com. July 15, 2013. Retrieved April 6, 2015. ^ "Emmy Award Nominations: Full List of 2015 Emmy Nominees". Variety. July 16, 2015. ^ "68th Primetime Emmys Nominees and Winners". Emmys.com. July 14, 2016. Retrieved August 21, 2016. ^ "The complete list of 2017 Emmy winners and nominees". Los Angeles Times. September 17, 2017. ^ "70th Emmy Awards Nominees and Winners". emmys.com. Retrieved September 14, 2018. ^ Knox, David (October 28, 2010). "Airdate: Conan". TV Tonight. Retrieved November 1, 2010. ^ a b "Triple Play: The Comedy Network Delivers Hilarious Late-Night Comedy Block with The Daily Show, The Colbert Report, and Conan". ctvmedia.ca. CTV Television Network. November 1, 2010. Archived from the original on July 27, 2011. Retrieved November 20, 2010. ^ "Daily Show: The Sanity Bus Makes it to D.C." thecomedynetwork.ca. The Comedy Network. October 29, 2010. Archived from the original on November 2, 2010. Retrieved October 29, 2010. ^ Allison (August 21, 2013). "Conan is coming to MUCH this fall". Much Music. Archived from the original on August 23, 2013. Retrieved August 25, 2013. ^ Jackson, Bart (April 13, 2010). "Conan O'Brien okays deal for new talk show". Vancouver Sun. Retrieved April 13, 2010. ^ S., L. (August 27, 2009). "Programa de Conan O' Brien regressa à SIC Radical". Diário de Notícias. Archived from the original on September 25, 2015. Retrieved June 14, 2015. Wikimedia Commons has media related to Conan O'Brien.